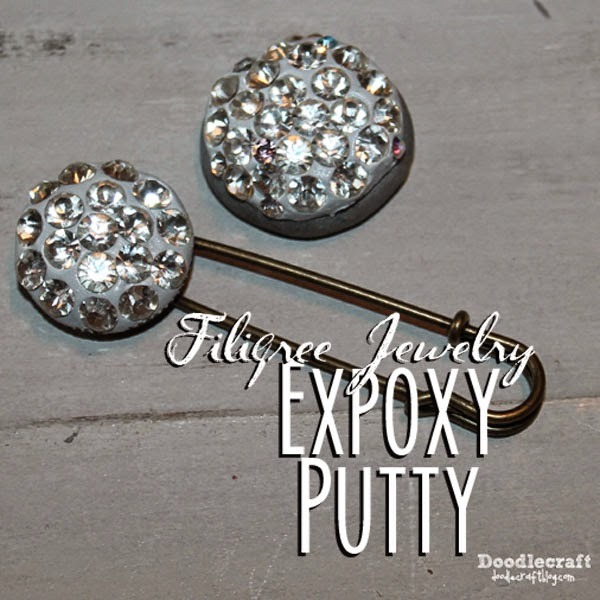 Doodlecraft: Epoxy Putty Filigree Jewelry! Make a bedazzled cape clasp with this easy method! I used J-B Weld PlasticWeld Epoxy Putty. This epoxy is great for repair work and fixing plastics! I knew it would be fun to craft with too! It comes in a tube...white material in the center and blue around the edges. Just cut a piece off and mix together. I hardly used any of my supply. It's the mixing that causes the chemical reaction to make it bond! It also smells like a perm...so get some ventilation! Press it on your bezel blank. Now stick rhinestones in it! The epoxy takes about 20 minutes to harden and overnight to cure completely. Just press the points in the clay deep enough for it to bond and hold. Now you have a fancy clasp for your cape! Check out more on robes and capes! This technique would work on bottle cap necklaces, pendant bezels or buttons!